The team here at More Space Place Jacksonville specializes in custom closet creation for the everyday user. We understand that everyone organized and uses their closet in different ways, so it’s important to cater to your personal needs. Get started today with a free consultation to design the closet of your dreams! Let’s take a look at a few of the most common closet set ups. The standard closet setup is one long clothing rod with a shelf or two for stacking your storage or bulky items. Take it up a notch with custom features to take advantage of every inch. Not only will this give you a more sleek, stylish space, but it will also help you keep your closet organized, uncluttered, and easy to use. Reach-ins are perfect for kids who have small wardrobes and won’t want to continually clean a large space. However, don’t just settle for the cookie-cutter closet. Customizing your child’s reach-in can drastically improve their organization and make your life as a parent much simpler. Allow us to design a closet with their needs, their wardrobe, and their height in mind. 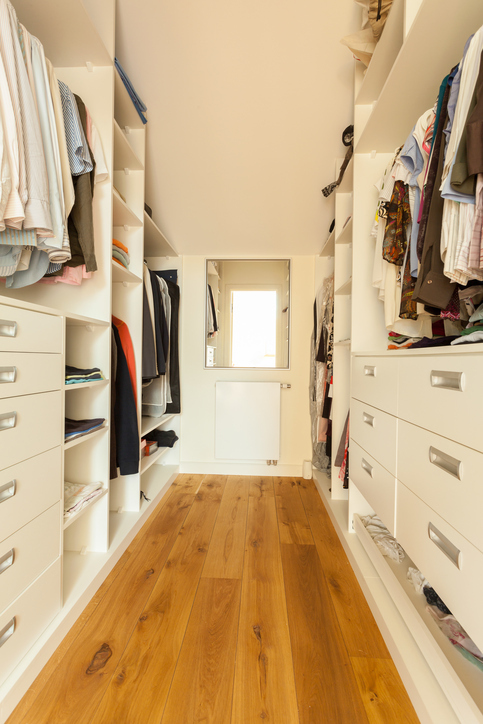 Easy to use features such as open storage, short drawers, and labeled cubbies make it easy for them to take responsibility of keeping their closet clean. Most importantly opt for adjustable shelving and rods so their closet can grow with him. Every adult with a large wardrobe dreams of the day they can get a walk in closet to display their clothes. For the modern professional, we can install multi-level clothes rods to optimize your vertical space. For the jean-enthusiast, deep drawers with transparent doors will help you stack and display your denim, while still keeping your closet feeling spacious. Other convenient features for the everyday walk in are organized laundry space, sliding doors, show racks, cubbies, and more. 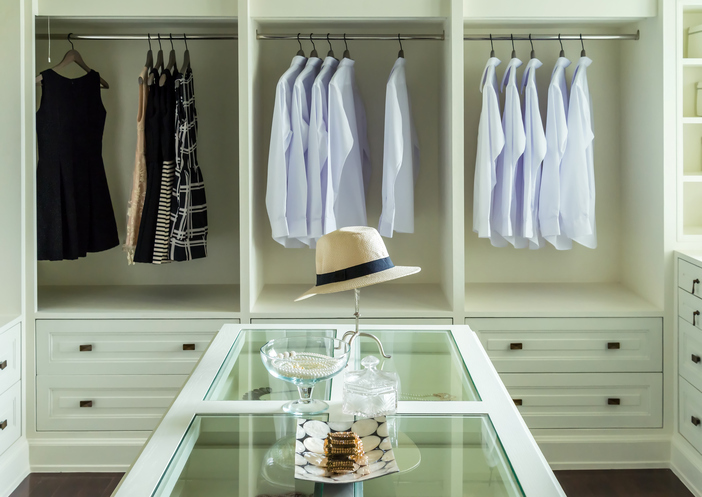 A boutique closet is a luxurious privilege for those with excess space in their home. Start with our wall mounted and floor based systems to best suit your storage needs. We can include drawers and shelves at a variety of heights, depths, and lengths. Then build off those foundational pieces with adjustable rods for hanging clothes and keeping dress shirts or pants wrinkle-free! Our double-hung closet rod systems can double, or even triple your closet space. Lastly, a valet rod will help you set aside tomorrow’s outfit to make your mornings even easier. The centerpiece of your boutique closet will be a stylish island. With ample surface space, you can lie out your accessories or keep folded laundry organized. Inside your island, opt for velvet-lined jewelry drawers to safely and neatly store your valuable pieces. No more tangled necklaces in a creaky jewelry box! Our custom drawers can be divided with small, individual units for your earrings and necklaces. Your custom island can also include tie racks, shoe storage, or attached bench to make getting ready a more comfortable experience. Enjoy the spaciousness of your closet and include cozy rugs, elegant lighting fixtures, and floor length mirrors. Ready for your dream closet? Call More Space Place! We proudly serve the greater Jacksonville area and offer complementary in-home design consultations to plan out your design and offer a free, competitive price estimate. Contact us today!